August 2014, STEP, alongside ICAEW and The Law Society of England and Wales, updated their joint guide to the treatment of UK trusts under the UK-US Intergovernmental Agreement (IGA) to take into account minor revisions from HMRC. The trust tests (left hand side of the flowchart) have been amended. Detailed questions in Appendix II of the guidance have also been revised to reflect this. The changes are not fundamental. On June 24, 2014 the IRS released an updated version of the FATCA FFI Agreement for Participating FFI and Reporting Model 2 FFI, just one week before FATCA withholding begins July 1st. The previous FFI agreement version was released January 13th as Revenue Procedure 2014-13 (see my article link). The IRS has updated the FFI agreement make it consistent with the coordination temporary regulations under chapter 4 of the Code, chapters 3 and 61 of the Code, and section 3406, which were released on February 20, 2014. (link to my article on these US Withholding and Documentation Rules changes). This revenue procedure also provides guidance to FFIs and branches of FFIs treated as reporting financial institutions under an applicable Model 2 intergovernmental agreement (IGA) (reporting 2 Model 2 FFIs) on complying with the terms of the FFI agreement, as modified by the Model 2 IGA. The FFI agreement does not apply to a reporting Model 1 FFI, or any branch of such an FFI, unless the reporting Model 1 FFI has registered a branch located outside of a Model 1 IGA jurisdiction so that such branch may be treated as a participating FFI or reporting Model 2 FFI. In such a case, the terms of the applicable FFI agreement apply to the operations of such branch. A reporting Model 2 FFI should apply the FFI agreement by substituting the term “reporting Model 2 FFI” for “participating FFI” throughout the FFI agreement, except in cases where the FFI agreement explicitly refers to a reporting Model 2 FFI. The FFI agreement in section 5 of this revenue procedure shall apply to an FFI that has submitted a FATCA registration with the IRS to be treated as a participating FFI (including a reporting Model 2 FFI) and that has received a global intermediary identification number (GIIN), regardless of whether the FFI receives a GIIN before or after the effective date of this revenue procedure. How Many FFIS are Impacted by this Change? About 26% (19,960) of the registered FFIs are impacted by the FFI agreement changes, in addition to any new registrations from the current 9 Model 2 countries/jurisdictions and 171 countries/jurisdictions without an IGA. 77,353 financial institutions and their branches registered from 205 countries and jurisdictions, of a total of 250 countries and jurisdictions recognized by the USA. Of this total registered, 71,219 FFIs (92%) registered from the 79 countries and jurisdictions that as of June 23rd have an IGA. 57,393 FFIs registered from Model I IGA jurisdictions probably either as a category of a Model 1 Deemed Compliant FFI or as a branch. However, 13,826 of these registered as Model 2 reporting FFIs or branches. At least these 13,826 are impacted by the FFI Agreement changes. Only 6,134 FFIs registered from the remaining non-IGA countries / jurisdictions either as Participating FFIs or branches. These 6,134 are also impacted by the FFI agreement changes. 45 countries and jurisdictions did not have a single FFI or branch registration on the GIIN List. Presumably, FFIs and / or branches from these countries, such as Kosovo, will find their way unto the July 1st GIIN list. Meanwhile, 30% withholding on all withholdable payments to nonparticipating FFIs in the 171 non-IGA countries begins next week on July 1. Most commentators expect a rush of over 300,000 FFI registrations by the end of 2014. Some predict more than a half million entities must still register, based on the UK’s HMRC estimate that 75,000 entities are impacted by FATCA within the United Kingdom (where less than 6,300 are currently registered on the GIIN list). Several definitions in section 2 of the FFI agreement are updated. For example, the terms chapter 4 withholding rate pool (including the U.S. payee pool) and chapter 4 reporting pool have been redefined and are further clarified. Section 3.02 of the FFI agreement is revised to incorporate the allowance for treating an obligation held by an entity that is issued, opened, or executed on or after July 1, 2014, and before January 1, 2015 as a preexisting obligation for purposes of applying the due diligence procedures under chapter 4 and the regulations thereunder, except that an FFI may not apply the documentation exception. Sections 4.01(D), 4.02(B), 6.05(A)(2), 6.07, and 9.02(B) of the FFI agreement are also updated to reflect that a participating FFI may elect to backup withhold under section 3406 rather than to withhold under chapter 4 on a withholdable payment that is a reportable payment made to certain U.S. non-exempt recipients only if the participating FFI complies with the information reporting rules under chapter 61 with respect to payments made to such account holders. In addition, section 5.02 of the FFI agreement (regarding tax withheld and set aside in escrow with respect to withholdable payments to certain dormant accounts) is revised to conform to the temporary chapter 4 regulations for when the tax must be deposited. Section 11.02(B) of the FFI agreement is revised to clarify that the responsibilities of a lead FI are only with respect to members of the FFI group that have designated the participating FFI to act as lead FI on their behalf. Additionally, if an FFI group has a consolidated compliance program, the participating FFI that is also the compliance FI for the members of the FFI group that are included in such compliance program must act as the lead FI for each such member of the FFI group. Section 9.02(B) of the FFI agreement also is revised to allow a participating FFI that receives a withholdable payment that is allocable to an account holder of the FFI that is a passive NFFE with one or more substantial U.S. owner(s) (or, in the case of a reporting Model 2 FFI, with one or more controlling persons as defined under the applicable IGA) to certify on a withholding statement provided to the withholding agent that the FFI is reporting the account holder as a U.S. account under the terms of the FFI agreement. When finalizing the temporary chapter 4 regulations, the Treasury Department and the IRS intend to amend the regulations to allow a withholding agent to rely on such a certification provided by a participating FFI, reporting Model 2 FFI, or reporting Model 1 FFI, which, absent a reason to know that the certificate is incorrect or unreliable, would relieve the withholding agent of its obligation to obtain and report information about a passive NFFE with substantial U.S. owners under section 1472. This amendment is intended to eliminate duplicative reporting of substantial U.S. owners (or controlling persons) of passive NFFEs required under section 1472 as well as under the U.S. account reporting requirements of a participating FFI, reporting Model 2 FFI, or reporting Model 1 FFI under chapter 4 or an applicable IGA. Section 9.02(B) is also revised to provide that a participating FFI may allocate a portion of a withholdable payment to a group of documented account holders (other than nonqualified intermediaries or flow-through entities) for whom withholding and reporting is not required under chapter 3, 4, or 61. For example, a participating FFI may allocate a payment of bank deposit interest to a pool of documented foreign account holders rather than providing specific information and a valid withholding certificate or other appropriate documentation for each such payee. The Treasury Department and the IRS intend to amend the regulations to incorporate this change when the temporary chapter 4 regulations are finalized. On May 1, the IRS released 4 new FATCA Frequently Asked Questions (FAQs) and Answers. The 4 new FAQs address the topics of Responsible Officers, Branches/Disregarded Entities and Registration Update. 2 of the new FAQs, on Responsible Officer and on Branches, are further divided into multiple sub-questions. The new Q&A are posted below. The IRS answered important questions such as: How does a branch in a Model 1 IGA jurisdiction satisfy its FATCA registration requirements? How does a branch or a disregarded entity (DE) in a jurisdiction that does not have an IGA, or that is in a Model 2 IGA jurisdiction, satisfy its FATCA registration requirements? Q5. For each of the following FATCA classifications (i.e. Participating Foreign Financial Institution “PFFI”, PFFI that elects to be part of a consolidated compliance program, Registered Deemed-Compliant Foreign Financial Institution “RDCFFI”, Reporting Model 1 FFI, Limited FFI and US Financial Institution “USFI”) what type of individual may serve as a Responsible Officer for purposes of Part 1, Question 10 of the FATCA Registration? With respect to a PFFI, an RO is an officer of the FFI (or an officer of any Member FI that is a PFFI, Reporting Model 1 FFI or Reporting Model 2 FFI) with sufficient authority to fulfill the duties of a Responsible Officer described in a FFI Agreement. With respect to a PFFI that elects to be part of a consolidated compliance program, an RO is an officer of the Compliance FI with sufficient authority to fulfill the duties of a Responsible Officer described in the FFI Agreement on behalf of each FFI in the compliance group (regardless of whether the FFI is a Limited FFI or treated as a Reporting Model 1 FFI or Reporting Model 2 FFI). With respect to a RDCFFI, other than a RDCFFI that is a Reporting Model 1 FFI, an RO is an officer of the FI (or an officer of any Member FFI that is a PFFI, Reporting Model 1 FFI, or Reporting Model 2 FFI) with sufficient authority to ensure that the FFI meets the applicable requirements to be treated as a RDCFFI. With respect to a Reporting Model 1 FFI, an RO is any individual specified under local law to register and obtain a GIIN on behalf of the FFI. If, however, the Reporting Model 1 FFI operates any branches outside of a Model 1 IGA jurisdiction, then the RO identified must be an individual who can satisfy the requirements under the laws of the Model 1 IGA jurisdiction and the requirements relevant to the registration type selected for each of its non-Model 1 IGA branches. With respect to a Limited FFI, an RO is an officer of the Limited FFI (or an officer of any Member FI that is a PFFI, Reporting Model 1 FFI, or Reporting Model 2 FFI) with sufficient authority to ensure that the FI meets the applicable requirements to be treated as a Limited FFI. With respect to a USFI that is registering as a “Lead FI”, an RO is any officer of the FI (or an officer of any Member FI) with sufficient authority to register its Member FIs and to manage the online FATCA accounts for such members. By checking this box, I, _________, [(the responsible officer or delegate thereof (herein collectively referred to as the “RO”)], certify that, to the best of my knowledge, the information submitted above is accurate and complete and I am authorized to agree that the Financial Institution (including its branches, if any) will comply with its FATCA obligations in accordance with the terms and conditions reflected in regulations, intergovernmental agreements, and other administrative guidance to the extent applicable to the Financial Institution based on its status in each jurisdiction in which it operates. *Note: Part 4 of Form 8957 contains a substantially similar certification. Can this statement be broken down into two declarations of the RO, as follows? (i) The RO certifies that, to the best of its knowledge, the information submitted above is accurate and complete. (ii) The RO agrees that the FI (including its branches, if any) will comply with its FATCA obligations in accordance with the terms and conditions reflected in regulations, intergovernmental agreements, and other administrative guidance to the extent applicable to the FI based on its status in each jurisdiction in which it operates. Does the first declaration above mean that the RO certifies that, to the best of its knowledge, the FI meets the requirements of its claimed status? Does the second declaration above apply to an FI treated as a reporting Model 2 FFI? Does the second declaration above (relating to a Participating FFI) require the signing party to ensure that the FFI and its member FFIs (including its branches, if any) comply with its respective obligations under the terms of its FFI Agreement or any applicable intergovernmental agreement and any such applicable local law? The second declaration requires the signing party to be able to certify that, to the best of the signing party’s knowledge at the time the FATCA registration is signed, the FI and its member FFIs intend to comply with their respective FATCA obligations. How do the certifications in Part 4 apply to FIs treated as reporting Model 1 FFIs? The first declaration above applies to FIs treated as reporting Model 1 FFIs and, as such, the RO of an FI treated as a reporting Model 1 FFI certifies that, to the best of the RO’s knowledge, the information submitted as part of the FATCA Registration process is accurate and complete. The second declaration, however, has limited applicability to FIs treated as reporting Model 1 FFIs because the FI does not have ongoing FATCA compliance obligations directly with the IRS. Instead, the compliance and reporting obligations of an FI treated as a reporting Model 1 FFI are to its local authority. However, a reporting Model 1 FFI that has branches (as identified in Part 1, line 9 of Form 8957) that are located outside of a Model 1 IGA jurisdiction will also agree to the terms applicable to the statuses of such branches. Additionally, an FI (including an FI in a Model 1 IGA jurisdiction) that is also registering to renew its QI, WP, or WT Agreement will agree to the terms of such renewed QI, WP, or WT Agreements by making the second declaration. For each of the following FATCA classifications (i.e. Participating Foreign Financial Institution “PFFI” for Reporting Model 2 FFI, Registered Deemed Compliant Foreign Financial Institutions “RDCFFI” (for both Model 1 and non-Model 1 FFIs), Sponsoring Entity, Limited FFI or Limited Branch, Renewing QI/WP/WT, US Financial Institution “USFI” treated as a Lead FI and Direct Reporting NFFE) what is the impact of completing Part IV of the FATCA Registration? Reporting Model 2 FFIs are registering to obtain a GIIN, provide authorization for individuals named in Part 1, Line 11 of the FATCA Registration to receive information related to FATCA registration, and to confirm that they will comply with the terms of an FFI Agreement in accordance with the FFI agreement, as modified by any applicable Model 2 IGA. Notwithstanding the paragraph above, Reporting Model 2 FFIs operating branches outside of Model 1 or 2 IGA jurisdictions are agreeing to the terms of an FFI Agreement for such branches, unless the branches are treated as Limited Branches or are U.S. branches that are treated as U.S. persons. Additionally, Reporting Model 2 FFIs requesting renewal of a QI, WP or WT Agreement are entering into the renewed Model QI, WP, or WT Agreements, as applicable. Reporting Model 1 FFIs are not entering into FFI Agreements via the FATCA registration process. Reporting Model 1 FFIs are registering to obtain a GIIN and to provide authorization for individuals named in Part 1, Line 11 of the FATCA Registration to receive information related to FATCA registration. Notwithstanding the preceding sentence, Reporting Model 1 FFIs operating branches outside of Model 1 or 2 IGA jurisdictions are agreeing to the terms of an FFI Agreement for such branches, unless the branches are treated as Limited Branches. Additionally, Reporting Model 1FFIs requesting renewal of a QI, WP or WT Agreement are entering into such renewed Model QI, WP, or WT Agreements, as applicable. An FFI that is registering as an RDCFFI, other than a Reporting Model 1 FFI, is agreeing that it meets the requirements to be treated as an RDCFFI under relevant Treasury Regulations or is agreeing that it meets the requirements to be treated as a RDCFFI pursuant to an applicable Model 2 IGA. An entity that is registering as a Sponsoring Entity is agreeing that it will perform the due diligence, reporting and withholding responsibilities of one or more Sponsored FFIs or Sponsored Direct Reporting NFFEs. An FFI that is registering as a Limited FFI is confirming that it will comply with the terms applicable to a Limited FFI. A branch of a PFFI that is registering as a Limited Branch is confirming that it will comply with the terms applicable to a Limited Branch. GIINs will not be issued to a Limited FFI or Limited Branch. An FFI, including a foreign branch of a USFI, requesting renewal of a QI Agreement is agreeing to comply with the relevant terms of the renewed Model QI Agreement with respect to its branches that are identified as operating as a QI. The obligations under the renewed Model QI Agreement are in addition to any obligations imposed on the FFI to be treated as a PFFI, Reporting Model 2 FFI, RDCFFI, or Reporting Model 1 FFI. An FFI that is applying to renew its WP or WT Agreement is agreeing to comply with the relevant terms of the renewed Model WP or WT Agreement. The obligations under the renewed Model WP or WT Agreement are in addition to any obligations imposed on the FFI to be treated as PFFI, Reporting Model 2 FFI, RDCFFI, or Reporting Model 1 FFI. Additionally, a QI, WP, or WT is also certifying that it has in place and has implemented written policies, procedures, and processes for documenting, withholding, reporting and depositing tax with respect to its chapters 3 and 61 withholding responsibilities under its QI, WP, or WT Agreement. A USFI that is part of an EAG and registering its Members FIs is agreeing to manage the online FATCA account for each such Member FI. A direct reporting NFFE is agreeing to comply with the terms and obligations described under Treas. Reg. § 1.1472-1(c)(3). How does a disregarded entity (DE) in a Model 1 IGA jurisdiction satisfy its FATCA registration requirements? A DE in a Model 1 IGA jurisdiction must register as an entity separate from its owner in order to be treated as a reporting Model 1 FFI, provided that the DE is treated as a separate entity for purposes of its reporting to the applicable Model 1 jurisdiction. Select either a “Single” FFI or “Member” FFI in Part 1, Question 1 of the FATCA Registration (as appropriate). Select “Registered Deemed-Compliant Financial Institution (including a Reporting Financial Institution under a Model 1 IGA)” in Part 1, Question 4. When the owner of the DE registers on its own behalf, it should not report the DE as a branch. How does a branch in a Model 1 IGA jurisdiction satisfy its FATCA registration requirements? In general, a branch (as defined in Treas. Reg. § 1.1471-4(e)(2)(ii)) should be registered as a branch of its owner and not as a separate entity. Thus, the branch will be registered by the FI of which the branch is a part (including an appropriate Lead FI or Sponsoring Entity) when that FI completes Part 1 of its own FATCA registration. The online registration user guide provides further instructions on how to register branches. In general, a branch is a unit, business, or office of an FFI that is treated as a branch under the regulatory regime of a country or is otherwise regulated under the laws of such country as separate from other offices, units, or branches of the FI. How does a branch or a disregarded entity (DE) in a jurisdiction that does not have an IGA, or that is in a Model 2 IGA jurisdiction, satisfy its FATCA registration requirements? A branch (including a DE) that is in a Model 2 IGA jurisdiction, or a jurisdiction without an IGA, should be registered as a branch of its owner (rather than as a separate entity). As such, the branch will be registered by the FI of which the branch is a part (including an appropriate Lead FI or Sponsoring Entity) when that FI completes Part 1 of its own FATCA registration. The branch will not have a separate registration account, but will be assigned a separate GIIN, if eligible. When the FI completes its FATCA registration and registers its branches by answering Questions 7, 8, and 9, GIINs will be assigned with respect to the registered branches, where appropriate. The online registration user guide provides further instructions on how to register branches. A separate GIIN will be issued to the FI to identify each jurisdiction where it maintains a branch that is participating or registered deemed-compliant. All branches (and, except in Model 1 IGA jurisdictions, disregarded entities) of an FI located in a single jurisdiction are treated as one branch and, as a result, will share a single GIIN. U.S. branches and limited branches are not eligible to receive their own GIINs. A branch of an FFI located in the FFI’s home country will use the GIIN of the FFI. For example, suppose FI W (located in Country X) has one branch in Country X, two branches in Country Y and owns a DE in Country Z. Country Z is a Model 1 IGA jurisdiction. FI W will receive a Country X GIIN. FI W’s Country X branch will use W’s GIIN. The two branches in Country Y will be treated as a single branch, and so FI W will be issued a single Country Y GIIN for these two branches to share. The Country Z DE will register as an entity separate from its owner, in order to be treated as a reporting Model 1 FFI, and will receive its own GIIN. 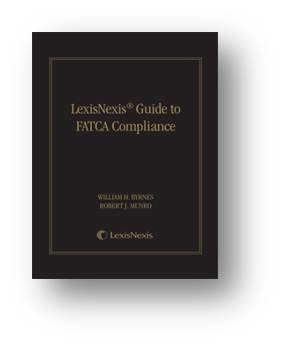 The LexisNexis® Guide to FATCA Compliance (2nd Edition) comprises 34 Chapters grouped in three parts: compliance program (Chapters 1–4), analysis of FATCA regulations (Chapters 5–16) and analysis of Intergovernmental Agreements (IGAs) and local law compliance challenges (Chapters 17–34), including intergovernmental agreements as well as the OECD’s TRACE initiative for global automatic information exchange protocols and systems. The 34 chapters include many practical examples to assist a compliance officer contextualize the regulations, IGA provisions, and national rules enacted pursuant to an IGA. Chapters include by example an in-depth analysis of the categorization of trusts pursuant to the Regulations and IGAs, operational specificity of the mechanisms of information capture, management and exchange by firms and between countries.